서울시 광진구 아차산(해발 285m)일대에 있는 삼국시대 산성이다. 성 전체 길이는 1,125m이며, 성벽의 높이는 평균 10m 정도이다. 동·서·남쪽에 문이 있던 흔적과 물길이 남아있고, 문 앞을 가려 보호하는 곡성이 남아있다. 그 밖에 여러 건물터가 남아있는데, 많은 토기와 기와조각이 수습되었다. 아차산성에는 2가지 슬픈 역사가 전해온다. 하나는 백제의 수도 한산이 고구려에 함락되었을 때 개로왕이 성 아래에서 죽임을 당했으며, 다른 하나는 고구려 평원왕의 사위인 온달장군이 죽령 이북의 잃어버린 땅을 찾기 위하여 신라군과 싸우다가 이 성 아래에서 죽었다는 것으로, 이러한 전설을 간직한 온달샘이 성안에 있다. 서울특별시 광진구 광장동에 있는 삼국 시대의 석축 산성으로 둘레 약 1,125m이다. 아차산(阿且山: 아차산(峨嵯山))의 남쪽으로 경사진 산허리의 윗부분을 둘러쌓은 테뫼식산성으로 현재 동·서·남쪽에 문지와 수구터가 있고, 북쪽과 서쪽·동쪽 등의 회절(回折)하는 곳마다에 곡성(曲城) 겸 망루터가 있다. 일명 아단성 (阿旦城) 또는 아차산성(阿且山城)·장한성(長漢城)·광장성(廣壯城)으로도 불린다. 축성 연대는 백제가 한강 유역에 도읍하였을 때 고구려의 남진에 대비하여 쌓았다는 견해가 있다. 산성은 표고 205m의 산꼭대기에서 시작하여 동남의 한강변 쪽으로 경사진 산허리의 윗부분을 둘러쌓았는데 규모가 매우 커 성내에 작은 계곡이 있다. 성벽의 구조는 기복적으로 삭토법(削土法)에 의하여 대체의 형태를 축조한 뒤 그 뒷부분을 따라 돌아가면서 성벽의 내외협축(內外夾築)으로 쌓았고, 성벽 바깥쪽의 아래는 다시 계단식의 경사가 완만한 보축을 돌리고 있다. 현재는 석축 부분이 무너져 토석혼축(土石混築)과 같은 외형을 이루고 있다. 성벽의 높이는 밖에서 보면 평균 10m정도이지만 그보다 더 높은 곳도 있다. 내측에서는 1∼2m 내의 높이로 보이지만 흙속에 묻혀있는 성벽은 석축이 2∼4m의 수직으로 남아 있다. 수구(水口) 부근은 평탄해져서 내벽은 남아 있지 않으나, 기초 부분은 묻혀 있으리라 여겨진다. 성밖으로 강변 나루터에 이르기까지의 사이에는 좌우 양편의 지형을 이용, 삭토(削土) 혹은 판축(版築)하여 성벽을 연장하였던 흔적을 찾을 수 있으나, 지금은 주택들이 들어서서 그 원형을 잃게 되었다. 특히 이 산성은 한강을 사이에 두고 맞은편 남쪽에 있는 풍납리토성(風納里土城)과 함께 백제 수도의 운명을 좌우하는 도하처(渡河處)를 수비하기 위하여 쌓은 중요한 성곽이었던 것으로 보인다. 이 산성은 삼국사기(三國史記)에 기록된 백제 시대의 유명한 아단성(阿旦城) 혹은 아차성(阿且城)으로 비정하고 있다. 한편, 백제(百濟)의 수도 한산(漢山)이 고구려(高句麗)에 함락되었을 때 개로왕(盖鹵王)이 이 성 아래에서 피살되었으며, 고구려(高句麗) 평원왕(平原王)의 사위 온달(溫達)이 죽령 이북의 실지(失地)회복을 위하여 출정하여 신라군(新羅軍)과 싸우다가 역시 이 성 아래에서 전사하였다는 역사적 전설이 성안의 샘을 온달샘이라하여 전해지고 있다. 성안에서는 백제와 신라의 유물들이 많이 나오고 있어서, 신라가 한강 유역을 차지한 이후도 중요한 역할을 하였던 성터로 여겨지고 있다. This is a fortress located around Achasan Mountain (285 meters above sea level), Gwangjin-gu, Seoul, and was built of stone during the Three Kingdoms Period. The total length of this fortress is 1,125 meters and the height is about 10 meters. There remain traces of gates and waterways on the east, the west, and the south, and also the curved walls which were built to protect the inner wall by covering the front of gate. Many pieces of earthenware and broken roof tiles were found at various sites. 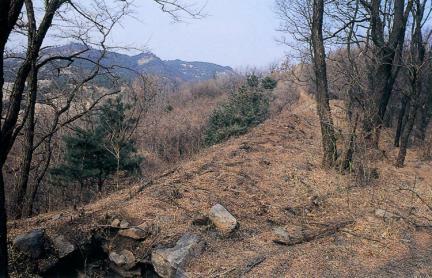 It is told that Achasanseong Fortress has 2 tragic histories. One is that the King Gaero of the Baekje Dynasty was killed under the walls when Hansan, the capital city of Baekje, was occupied by Goguryeo forces, the other is that in the fortress there is the Ondalsaem spring which has kept a historical tradition saying that General Ondal, the son-in-law of King Pyeongwon of Goguryeo, died under the walls in a battle with Silla forces to recover the lost southern area between Goguryeo and Jungnyeong. 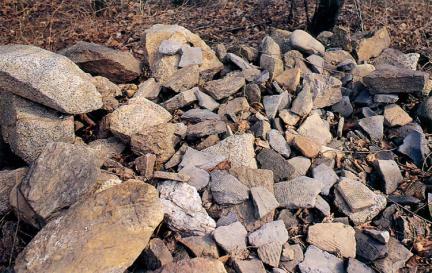 In 1997, the Achasanseong Fortress was excavated by a team from Seoul National University Museum, and, after many relics including more than 100 pieces of earthenware, more than 30 pieces of steel artifacts, and more than 100 pieces of weapons were discovered, it was confirmed that it is a Goguryeo, not a Baekje site. This work is expected to contribute greatly to the study of the culture of the Goguryeo Dynasty around this region, though further detailed investigation and excavation are required. Achasanseong Fortress has significance as a historical site where the Three Kingdoms competed to occupy the valley of the Hangang River, though there still remains debate as to by which dynasty it was built.